The local and international communities came together on Friday, April 27th and Saturday, April 28th, 2012, to commemorate and celebrate Santa Cruz as a World Surfing Reserve, in a series of dedication events that included a number of festivities, from an “Evolution of the Wetsuit” fashion show to a spiritual paddle out at Pleasure Point. 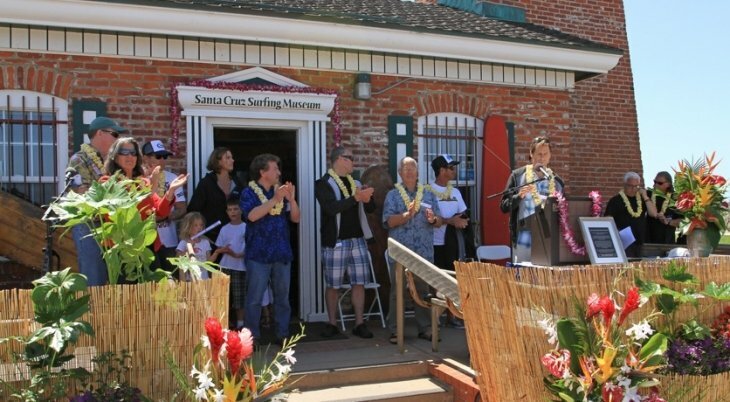 The official dedication event took place in front of the Santa Cruz Surfing Museum at Steamer Lane, and featured a collection of inspiring speeches from local surfing and environmental leaders and public officials. The heralded Santa Cruz surf zone – designated as the area from Natural Bridges on the western end to Opal Cliffs just east of Pleasure Point –joins only three other sites to claim such status—Malibu in California, Ericeira in Portugal, and Manly Beach in Australia. On Friday night, the community held a celebration at the Cocoanut Grove at the Santa Cruz Beach Boardwalk, which included a show tracing the evolution and development of the modern surfing wetsuit from the 1950s to present, using local surfing celebrity models. The show began with the precursor to the wetsuit, a high-waisted “speedo-type” belted swim suit made of wool, and ended with a 2013 O’Neill wetsuit. Saturday morning at Pleasure Point, Ohlone Native American Indian Elder and Shaman Patrick Orozco led a moving blessing on the beach that was followed by a beautiful song performed by local musician and pro surfer Ashley Lloyd. Surfers then paddled out into the kelpy waters of Pleasure Point where they were joined by outrigger canoes and united in a circle and gave thanks to the natural and cultural surfing heritage of Santa Cruz. During the paddle out, local icon Jack O’Neill came out onto the balcony of his house at Pleasure Point and saluted the surfers, which was met by a loud chorus of cheers from all the surfers in the water. Finally, on Saturday afternoon, community members gathered at the Lighthouse lawn at Steamer Lane for the official dedication ceremony, and listened to brief talks from local leaders on the importance of protecting Santa Cruz’s waves and coastline. Santa Cruz received its approval as a World Surfing Reserve in February 2011. Its application ranked highly on all World Surfing Reserve criteria: wave quality and consistency, unique environmental characteristics, surf culture and history, and community support. More than 23 surf spots dot the area’s coastline, with several iconic locations such as Steamer Lane and Pleasure Point. The cold-water marine environment not only provides a playground for surfers, but also provides habitat for one of the most robust coastal and marine ecosystems on the planet. Santa Cruz’s importance in the history of surfing is undeniable. It was the birthplace of surfing on the North American continent and played a pivotal role in the creation and development of the surfing wetsuit, which opened up surfing to new regions around the world, as well as the leash. At the end of the dedication ceremony, the members of the Local Stewardship Council signed a plan for the ongoing management and stewardship of the Santa Cruz World Surfing Reserve. This plan outlines how the group would respond to threats that may arise, what type of stewardship activities the group will carry out, and how the group will reach out to the general public to provide education about Santa Cruz’s incredible surfing resources and how to protect them. “We see this designation not as a destination, but as a starting point for the community to now be coordinated and ready to protect this gem we call home,” said Ginaia Kelly, Executive Director, Save The Waves Coalition and World Surfing Reserves Executive Committee member.